Who’s who, who can help? So last time I introduced myself, and since then I’ve been trying to keep up with the emails, tweets, dm’s, LinkedIn messages, Facebook messages. I know I’ve liked all the comments and many of you I reached out to directly, I’m still working through the suggestions, requests and I am determined to get to them all – just keep them coming! Chris just hit me up over on Facebook with something he does monthly – awesome idea, now to work together and see how we can take it forward! I also had the pleasure of being part of the Coffee Corner Podcast, I was invited to join the 3rd episode. Fantastic podcast and we are going to start to feature them on the new homepage rolling out before SAP TechEd. One of the things I enjoy about community is the fact that it really knows no boundaries, all of these different connection points has shown me how diverse and distributed our fellow community members are! Keep it coming! I am honoured by all the congratulations and well wishes, I’m also excited to say that we hope to have more details to share soon – some of your comments have sparked new opportunities already and we are working through details now – this one is for you Colleen and Mark! Florian, I’m not 100% sure what you saw at TechEd and I agree that definition of “soon” is not mine own so we are working on that! Fausto, this is an intriguing idea and one that we’ve tried in the past before, perhaps it’s time to consider it again? Do others like this idea, shall we look into it? Some of you I have not yet had a chance to connect with, Michelle, I’m hoping you have the time soon! Good to see you also still pushing your own local community activities Douglas! Today I wanted to take a moment to share a few things with everyone and of course to give everyone a glimpse into the team focused on all of you. Our groups role is to work with all of you and coordinate business requirements, community requirements with our Digital & Web group who are in direct and constant contact with our SAP IT organisation. This might seem like a complication but actually it’s a simplification. This allows us to focus on you, the people that make our community what it is; right now we are pushing hard and strong forward on multiple topics! 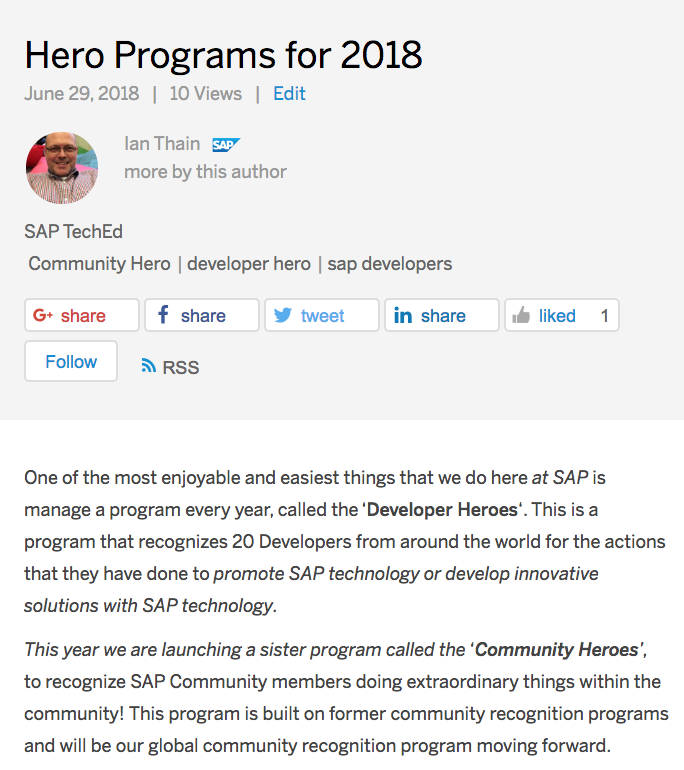 Svea, is organising all of our activities around community events including things like the SAP Inside Track and SAP Stammtisch and how we want top help enable them more! Mynyna, is working on updating our Rules of Engagement and Content Guidelines which will be rolling out here in the next few weeks with the new homepage. We’ve been a very busy bunch these past 4 weeks, from updates around our influencer programs. SAP TechEd planning, SAPPHIRE NOW, homepage and site updates, content guidelines, rules of engagement, connecting with the various user groups around the world, the list seems to just go on and on. We’ve also been getting to know each other as we re-merge two disconnected teams into a single unit with the passion and dedication to engage! Speaking of updates, I’m sure you noticed the tag rename to “SAP Community” but also today this just went out! Ian who is part of our extended team is helping to launch the new “Community Hero” program! Jerry is also continuing to work with the broader community around the members of the month and other engagement activities; we are going to expand the recognition of our moderators to monthly as well. It’s of course not all deep dive, nose to the grind stone – even we like to take a breather now and again and pop into the Coffee Corner for a distraction or two. Distractions aside, we hear you and we understand your frustrations and I could feed you all a line, I could make promises but instead I will just say to “watch this space” because we are pushing changes through as quickly as possible. We will be doing broader and more specific platform updates in the near future, right now the head of our Digital & Web team, Jim is tirelessly pushing on step by step to make things better. As always you are welcome to reach out to me directly anytime you like! Well if you mention me, I have to reply. Here I am! I’m so glad to see so many great people involved. This is really getting me excited. I will make time to help in anyway you think I can. I’ve got a lot going on at work… Who doesn’t, right? Hence I haven’t been her much lately. Mind dropping me a mail so I can set up a call? If I could be of help in any way, I would also be available! Thank you for considering our (community) proposals. It is really rewarding when ideas and proposals are moved ahead. If it happens and get a good format it will be fun. 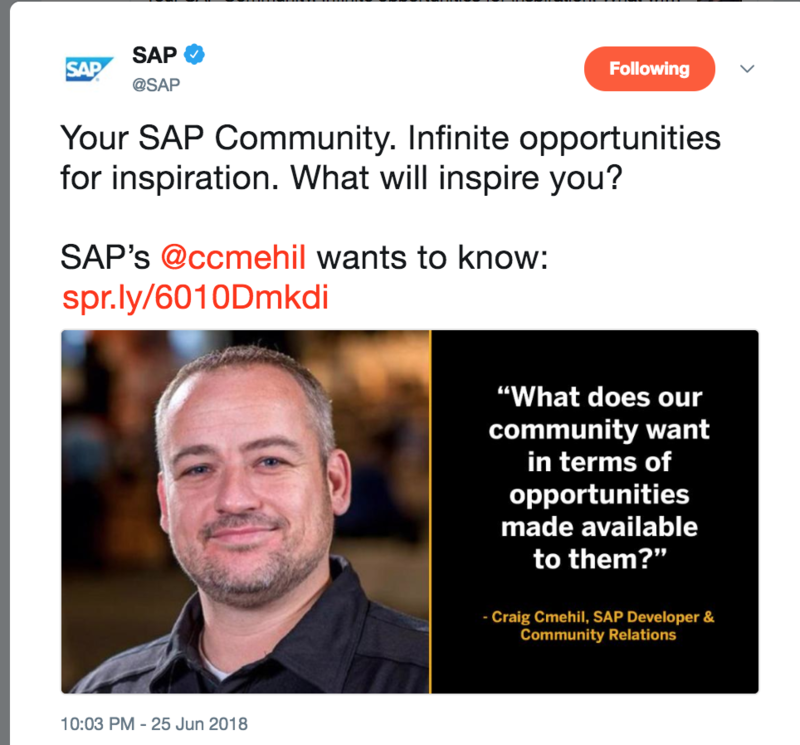 Amazing how you keep track of all the ideas Craig …and very nice that you gave it a very personal touch and reached out to a lot of people who took the time to provide ideas to you…this is level of peesonal interaction is rarely seen by SAP! I am eally excited about what’s coming next. And provide some thoughts on the issues raised there ? there was this announcement about the redesign, which will make brwosing our community much smoother and bring back a structure to the different areas. Anyway, before triing to explain it here, did you visit the community booth at Teched last year? There was this live-presentation about the redesign of the community. Jamie will know more about it. As I mentioned we are pushing forward step by step with changes. Or did you have a specific question? If that question is did I visit the booth, yes, I did multiple times it was located next to the Developer Garage so was there quite a bit. I’m absolutely with you, when it comes to the step by step thing. I just thought, that the new design for the community is ready to deliver and just will not be delivered during the changes in the organisation which is totally fine with me, but just would love to have an ETA mentioned. I’ve seen all the demos, and we are pushing changes as fast as possible, I’m just not going to give empty deadlines. You guys have had your fair share of dates thrown at you already, instead we will start delivering; several things have already happened these are just not visible items these are more underlying platform adjustments. I’m looking forward to seeing the changes. I’m already having a bit of an experience as a newbie getting started in community all over again so it’s giving a bit of a different perspective to the challenges we all face.